Owner Martin Schwartz leads Zagora to the winner's circle after the Filly and Mare Turf. The $2 million Breeders' Cup Filly and Mare Turf featured 11 older fillies and mares going 1 1/4 miles on the turf. Nassau (G1) winner The Fugue was sent off as the 8-5 favorite off a close second in the Yorkshire Oaks (G1). 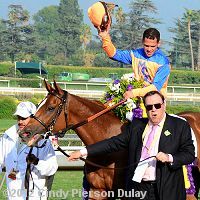 In to challenge her included 5-1 second choice Ridasiyna, off her Prix de l'Opera (G1) win, and 11-2 third choice Marketing Mix, winner of the Rodeo Drive (G1) last out. Jockey Victor Espinoza sent 38-1 Star Billing to the lead down the hill through fractions of 24.70, 48.72, 1:13.70, and 1:36.74 while stalked by Marketing Mix and 12-1 In Lingerie. Entering the lane for the last time, Star Billing tired allowing Marketing Mix to inherit a short lead but 9-1 Zagora, who sat fourth early, closed late to win by 3/4 length in 1:59.70. 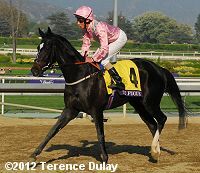 It was another 1/2 length back to late-running The Fugue third. 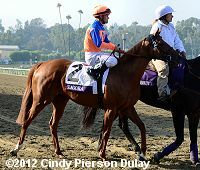 Right: Zagora heads over to the turf before the race. 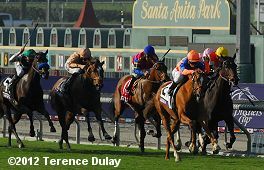 Jockey Javier Castellano said, "I had a beautiful trip. I was just where I wanted to be behind the speed. Turning for home, I went to the outside and she gave me a good kick. It's a pleasure to a part of this. Chad (Brown) gave me a great opportunity to ride her." Second place finisher Marketing Mix returns after the race. 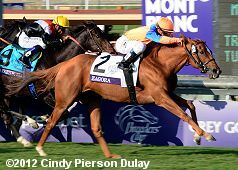 Trainer Tom Proctor said, " Our filly ran good; the other filly just ran better. This is an exceptional filly, and we're proud of her. 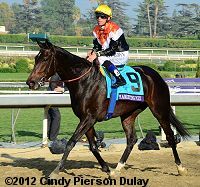 She will be going to Florida in a day or two to spend some time on the farm and she will be back in training next year." Jockey Garrett Gomez added, "I thought I was in a good spot all the way around. At the 3/8 pole, the tempo quickened, and when (Star Billing) went and I went with him. But then (Zagora), she just ran right by us." Right: Third place finisher and beaten favorite The Fugue returns after the race. Trainer John Gosden said, "She was a bit unlucky. She didn't have any room and William (Buick) was sitting there with nowhere to go. It was until the last 1/16 that she got out, and she finished well. That's racing." The trophy presentation for the Filly and Mare Turf. 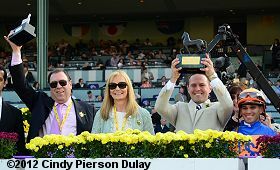 Owner Martin Schwartz (far left raising trophy) said, "I said why don't we try the Flower Bowl at 1 1/4, so we feel confident she can get the distance and as you know it was a bog that day and she lost in the last few jumps and that gave us total confidence. 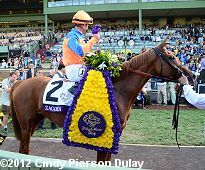 In addition, we felt that she would have an extra week to prepare for the Breeders' Cup and she would have 5 weeks instead of 4 and that was so Chad could work his magic. He's absolutely remarkable. When he tells me the horse is ready to run, they never run poorly."